I can't stop thinking about Judas. What if Judas didn't think his betrayal of Jesus was the end? What if he thought it was the beginning? What if he thought handing Jesus over to the authorities was secretly what Jesus wanted? After all, Jesus was the Messiah; Judas was sure of that. And the Messiah's job, his reason for coming, was to overthrow the Romans. What if Judas thought he was helping Jesus commit the ultimate coup? If Jesus were to get inside Pilate's compound, surely he would take up the sword, maybe even call down legions of angels to fight off the Roman oppressors and free the Jewish people. It's what Jesus wanted, isn't it? "What you are about to do, do quickly." It was tacit approval, wasn't it? An acknowledgement that Jesus knew and agreed with Judas' clandestine plot. The Messiah was bringing the kingdom, wasn't he? Last year, on Good Friday, I went with a group of friends to see "Kingdom Undone." It's a new passion play here in Minneapolis, a retelling of Jesus' final weeks, with this as its central theme: What if Judas did all the right things, for all the wrong reasons? It startled me to see it played out before me: Jesus' friends loved their master. They cared for him and laughed with him and fought for him and followed him. But they didn't understand him. Even after spending months, even years, doing life with Jesus, they couldn't really see him without looking through their own lens of prejudiced. They saw him as they wanted him to be, not as he really was. He wasn't the Messiah they expected. 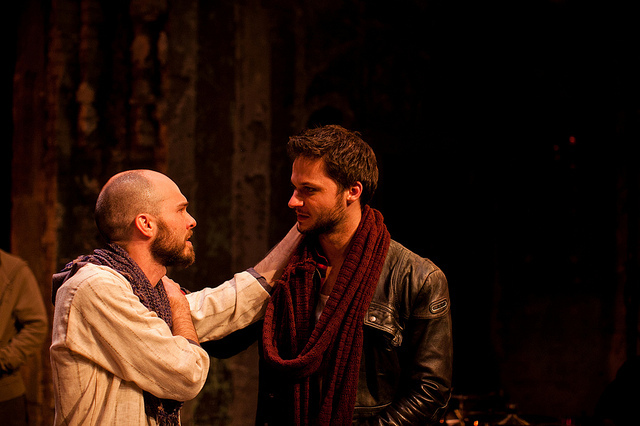 I can't stop thinking about Judas, because I am he. Jesus isn't the Messiah I expected either. I expected someone neater, someone who answers questions with black and white facts, not puzzles and riddles. I expected someone controlled, not a rabbi who destroys the temple with his fanaticism. I expected someone who would uphold God's ancient laws, not a teacher who flaunts them. I expected someone who would make my path easy. I expected someone who would tie up all the loose ends. I expected someone who would smile at my hard work, someone who would give me a gold star for my righteousness. I expected a Messiah of my own invention. What I got was Jesus. Kingdom Undone's run for this year just finished, but if you live in the Minneapolis area, I strongly urge you to put it on your calendar for next spring. It is story at its strongest. "I expected a Messiah of my own invention." Oh, sigh...I know this feeling. My invented messiah and yours sound as though they would be great friends. It's taken me a lifetime to figure out that I don't have anything figured out. So thankful that the Jesus who showed up wasn't the tidy, safe, clear-cut savior I wanted, but the sort I needed, one who would wreck and rescue me. Oooo, I like this. Good thoughts, friend.